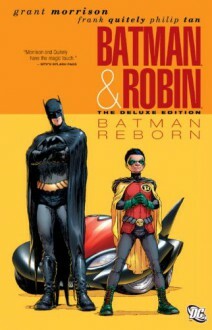 "Batman Reborn" begins here with the reunited team of Grant Morrison and Frank Quitely (ALL-STAR SUPERMAN, WE3,New X-Men). The new Dynamic Duo hit the streets with a bang in their new flying Batmobile as they face off against an assemblage of villains called the Circus of Strange. They also tackle their first mission investigating a child who's been abducted by the mysterious Domino Killer. But will everything go smoothly? And who exactly are the new Batman and Robin? The newest era of The Dark Knight begins here! Needed more Quietly art, otherwise pretty awesome. If the reason I read the Batman R.I.P. arc was for this, I'm so freaking glad. I LOVED THIS SO MUCH and I really didn't expect it to be as awesome as I thought it was. Bloody, brutal, and brilliant "Batman"! This was not a consistently interesting read, and I really hate reading Pyg's dialogues. But putting a naked Batman and Robin in front of a webcam for a www.unmasking was a fun moment- I only wish they had capitalized on the suspense it could have had.